to do everything possible to expand human potential. We do that by creating groundbreaking sport innovations, by making our products more sustainably, by building a creative and diverse global team and by making a positive impact in communities where we live and work. to use the power of sport to move the world forward. We believe in a fair, sustainable future—one where everyone thrives on a healthy planet and level playing field. 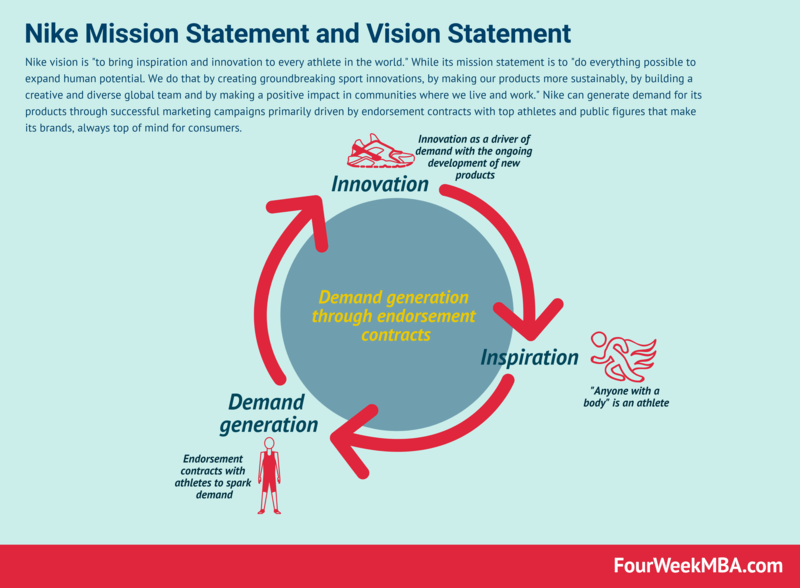 In Nike Business Model I highlighted how Nike strategy moves around demand generation. It is important to remark that when I say Nike, I refer to the company which owns several brands in six categories Running, NIKE Basketball, the Jordan Brand, Football (Soccer), Training and Sportswear (our sports-inspired lifestyle products). The amounts listed for endorsement contracts represent approximate amounts of base compensation and minimum guaranteed royalty fees we are obligated to pay athlete, public figure, sport team and league endorsers of our products. Actual payments under some contracts may be higher than the amounts listed as these contracts provide for bonuses to be paid to the endorsers based upon athletic achievements and/or royalties on product sales in future periods. Actual payments under some contracts may also be lower as these contracts include provisions for reduced payments if athletic performance declines in future periods. For instance, in 2018 over three billion dollars were spent toward demand creation expenses. This represented an increase of 7% compared to 2017, and it represented over 10% of Nike brands revenues for 2018.